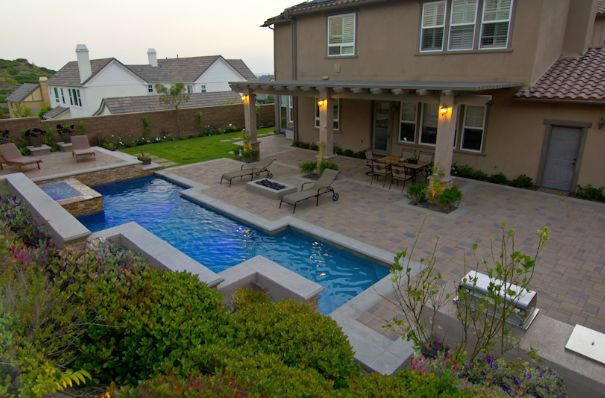 Architectural Landscape Design: Pro Solutions Since 2004. It was really our clients who identified our niche in the landscape design industry. Since 2004, people from New Mexico to Florida reached out over and over after their online research led them to us. All we were doing is writing a blog. People were looking at companies on the Internet but hadn't found anyone doing what we do: architectural landscape design with an ecological focus. When Eco-LogicSM was born, we knew we wanted to specialize in the professional combination of permaculture design and landscape architecture. This is why, folks tell us, we have been sought out for this long up and down the West Coast. Permaculture is ecologically-focused or regenerative landscape design. With permaculture, you can hang your hammock, relax, and take in the delicious scents as you watch your gorgeous landscape manage its own growth towards maturity. Permaculture Design expands the focus of traditional design to provide clients with landscapes that take care of themselves. This type of ecologically-focused design also offers a bounty of perennial delights for kitchen and beneficial wildlife. From low-maintenance plants to rainwater re-use, we incorporate architectural landscape design style and aesthetics with the deep wisdom of Nature to maximize the highest level of function within a beautifully clean overall look. Landscape Architecture incorporates traditional principles of line, form, & spatial relationship with a unique vision for each individual property. Architectural landscape design focused on traditional aesthetics and basic functionality translates the needs our clients express into formal solutions, resulting in a delightful re-imagining of a space within the bounds of tradition. Construction Management assures your master plan is installed correctly. We source quality builders, gather estimates for you, and then oversee the installation of your project once you choose the team you want. Relax and get back to your life while we expertly handle the day-to-day ups and downs of getting your design into the ground. Materials approvals and updates become your biggest commitment. No calling nurseries for substitutions, wondering what time your crew will arrive that day, or worrying if an element was installed right. Scheduling a FREE Coaching session is the best way to quickly get an exact strategy for your project. You can also send us a contact form if you have a question for a professional designer. Review your strategy with your designer, and get answers to your questions. If everything looks good, select the options that meet your needs, budget, and timeline, and secure your project with one third down via Paypal or check. Your designer will schedule a thorough Site Analysis, where we will measure your property and record site conditions to create an accurate Base Map. Meet with one of our team on-site, and prepare for about an hour to an hour and a half, depending on the size of your property and complexity of existing elements. Your designer uses the site analysis data to develop your plan. Midway through the project (typically about one and a half months, unless an expedited timeline), your designer will schedule an in-process Midpoint Meeting with you. This is when you will be able to see how we are transforming site issues into solutions unique to your property. This working meeting allows you to make changes to the design before it is finalized. Submit another third of our design fee at this time. Next, your designer will schedule your Final Design Presentation meeting (typically from four to six weeks, unless an expedited timeline), where you can virtually walk through your plan just as if your new landscape was already done. Pay your final third of the design fee and get your plans. If you have elected to include Construction Management of your project, your CM will schedule the installation of your project. Pay your construction management fee securely via Paypal or check and start to see your property transform in the coming weeks or months. We have worked successfully with all types of clients and accept projects ranging in scope from a suburban side yard to large rural acreages. If you are curious about how architectural landscape design infused with permaculture (or kept simply ornamental) can enhance your life and raise your property value, submit your questionnaire or schedule your free coaching session. The city of Portland, Oregon, honored Eco-LogicSM with a certificate identifying the company as an ecological business under its rigorous Eco-Biz Program. Keeping a satellite office in Portland, the company headquarters was moved to Pasadena, California. Eco-LogicSM Permaculture & Landscape Design is headed by multi-faceted creative Jadene Mayla. She began working as a permaculture designer in 2004 while getting a graduate degree in Landscape Architecture from the University of Oregon and a certificate in Permaculture Design from Cascadia Permaculture Institute, headed by Toby Hemenway and Jude Hobbs. Her final project won a national first place award, fueling her drive to offer "deep green" ecological design to the public. Jadene incorporates a decade and a half of experience serving clients in Oregon, California, Washington and other states. She accepts all types of projects, and is sought-out for her specialty of aesthetically combining landscape architectural techniques with permaculture principles in urban, suburban, and rural settings.